Thank you for your interest in volunteering at Daily Bread Food Bank! Daily Bread has worked with local business for more than twenty years, delivering an employee volunteer experience that fulfill our supporters’ goals while providing essential support for Daily Bread’s community food programs. Together, we will craft a volunteer experience that fits perfectly with what you are looking for in a team volunteer experience, whether it be a fully customized day for up to 100 employees that gets you behind the scenes at one of Canada’s largest food relief organizations or a morning of food sorting for a small team. Are you a not-for-profit community group? Please send an email to volunteer@dailybread.ca for more information. Are you interested in a hands-on volunteer experience for your team or department of 4 – 25 people? Do you want to commit time to supporting an organization that helps thousands of people a year through emergency food relief and vital advocacy work? If so, then Daily Bread’s Helping Hands packages are perfect for you! 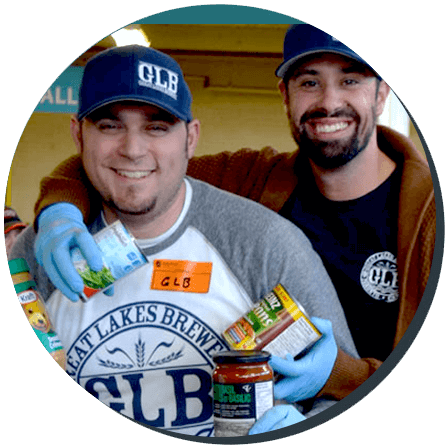 Our Helping Hands package gives teams of 4 – 25 employees the opportunity to help out in our kitchen, warehouse, on site food bank or sorting food donations Monday to Friday, throughout the year. You can book one sorting shift per day. Description: Assist on the front-line with the daily operation of the on-site food bank. Stocking shelves, portioning food, helping with check-out are the most common tasks. To learn more about our Employee Volunteer Program please click here. We understand the importance of providing your employees a meaningful opportunity to volunteer and develop skills that they can take back to their workplace. We also know the value of an impactful results oriented volunteer shift that delivers on your marketing and CSR targets. We’ll work with you to customize a true teambuilding opportunity where up to 100 of your employees will have a meaningful experience and measurable impact on the community. Please email Pam Bastedo at pam@dailybread.ca to set up a time to discuss. 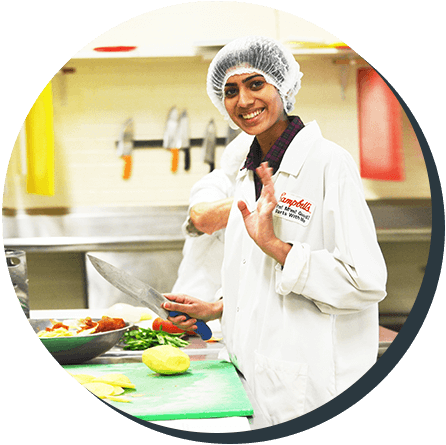 Daily Bread offers the some of the most diverse group volunteering opportunities in the GTA – we can accommodate groups of 4 to 100 volunteers, engaging them with hands-on work that will directly benefit people in our city. 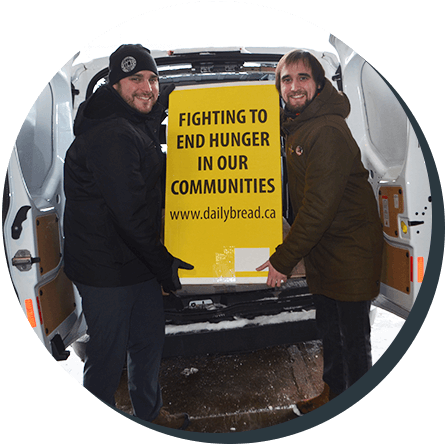 Not only will you gain an intimate understanding of Daily Bread’s innovative food distribution system, you will be at the heart and centre of Canada’s largest food bank making an immediate and positive impact in your city. 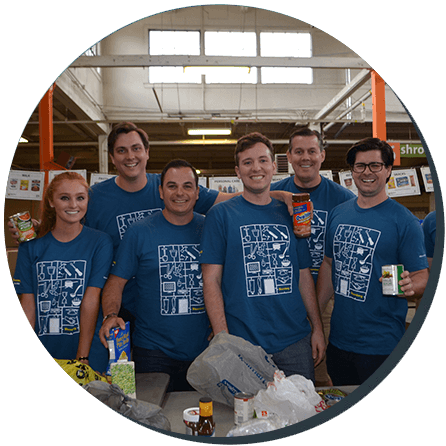 Daily Bread makes it easy for your team to volunteer and raise funds. We’ll be in touch at the right times with all the information and the tools to help you raise team spirit and funds leading up to your day including your own online, customizable donation page. 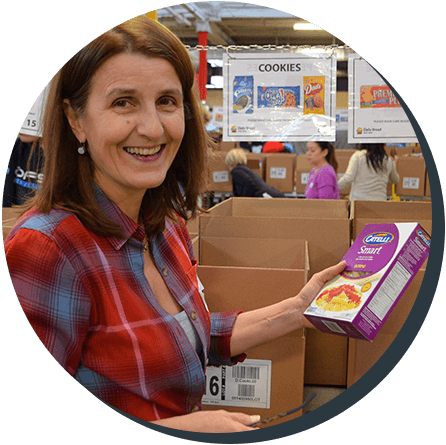 Volunteering at Daily Bread gives your team a tangible way to participate in a cause that Torontonians care about – a cause that has been committed to building healthier and stronger communities for over 30 years. And we’ll let you know the impact you’ve made and provide you with opportunities to share that impact with your network. Employee volunteering builds team spirit and boosts staff morale, improving your business culture. You can all take pride in the fact that your work has benefitted 170 local food programs that help over 120,000 people a year. Team Volunteering Days are a great experience! You’ll listen to music, get a rhythms going with your tasks and feel great about all you’ve accomplished when meet your target in a food sort, create meals in our kitchen or help community members in our food bank. Ready to book your shift? Read our FAQs then click here to get started!